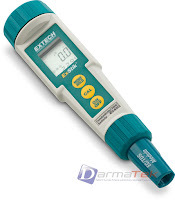 Extech EC-400 Conductivity Meter - Water Quality Tester . With the EC400’s dynamic cell-constant technology it is possible to measure a wide range of Conductivity, TDS, and Salinity with the same electrode. Careful use and maintenance will provide years of reliable service. Display: 2000 count LCD with Bargraph. 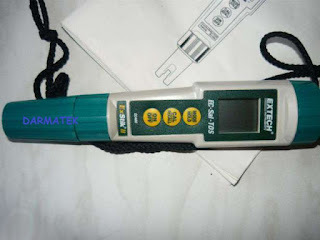 Conductivity range : 0 to 199.9¼ S, 200 to 1999¼ S, 200 to 19.99mS. TDS range : 0 to 99.9ppm or mg/ L, 100 to 999ppm or mg/ L, 1.00 to 9.99ppt or g/ L.
Salinity range : 0 to 99.9ppm, , 100 to 999ppm, 1.00 to 9.99ppt. TDS Ratio: 0.5. Temperature range : 32.0 to 149.0° F ( 0.0 to 65.0° C.
Automatic Temp. Compensation : 2% per ° C.
Measurement storage : 15 readings. Low battery indication : ‘ BAT’ appears on the LCD. Power : Four SR-44W button batteries : After 10 minutes of no button presses. Operating conditions : 32 to 122° F ( 0 to 50° C) . Weight: 2.8 oz. ( 110g) .